High Quality Content by WIKIPEDIA articles! 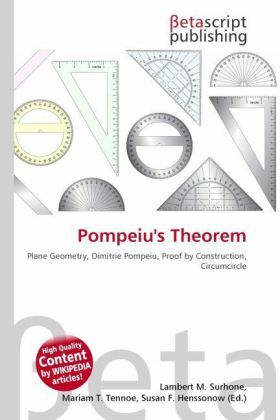 Pompeiu's theorem is a result of plane geometry, discovered by the Romanian mathematician Dimitrie Pompeiu. The theorem is quite simple, but not classical. It states the following: Given an equilateral triangle ABC in the plane, and a point P in the plane of the triangle ABC, the lengths PA, PB, and PC form the sides of a (maybe, degenerate) triangle. The proof is quick. Consider a rotation of 60° about the point C. Assume A maps to B, and B maps to B '.